This building has 16 class rooms, gymnasium, auditorium to seat nearly 600, also rooms for cooking and manual training. The Ridge School is an interesting design for a grade school located on a residential street. 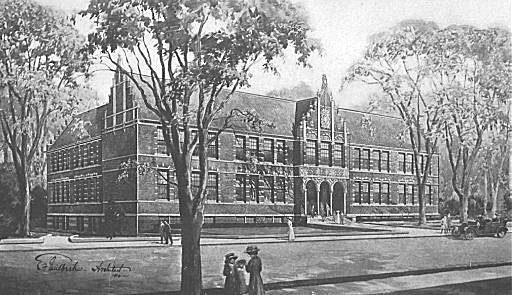 Its chief architectural features are derived from the brick architecture of Holland and carried out in a pleasing combination of re brick, stone, and light-colored terra cotta, which imparts to it a peculiarly domestic feeling, something to be desired in a building in which young children are to begin their education. There is a singular charm about the central pavilion with its arcaded entrance and large, elliptical headed windows above. The columns of the lower story are limestone, while the walls of the loggia are cement plaster marked off in courses similar to stone. The building contains fourteen class rooms, to accommodate about forty pupils each, a generally accepted and convenient number for securing equal advantages for every pupil. The arrangement of the class rooms follows the precedent of modern German schools in regard to lighting. Windows are placed on only one side of the room and the pupils are seated so that all the light comes from their left side. Wardrobes are provided for each class room with access to them from the rooms. The main floor contains a large assembly hall, two stories height, with a balcony at the rear. It is approached from the main entrance, so that if occasion demands it can be used for purposes other than those strictly connected with the school. The principal corridor and the location of the stairs in relation to it show a very efficient point in planning. The corridor runs parallel with the main frontage of the building with enclosed stairs occupying either end. Windows on these stairs provide cross ventilation, and access to the outside is arranged at a landing of the stairs on the grade level, making the dismissal of the pupils in case of emergency possible without any confusion and in a few minutes time.